Bright and Breezy Crafts: Bling it up! and immediately saw red gingham paper with it! I used kraft card and embossed the edge. I used a martha stewart punched lacy border along the bottom...and LOTS of bling! with a teeny bling flower to the left hand side. I finished off, with a little black faux stitching around the red gingham edge. Also, 2 Martha Stewart punched butterflies...made with a slightly sparkly card. this was a bit last minute. and this cute image from QKR Stampede. I handcut the circles - and the matting around them...it took a while! and free hand cut the little silver bubbles. Finally, I added a ribbon along the punched white border. These are wonderful creations with great details and perfect for our ‘ADD REAL RIBBON’ challenge. Thanks for sharing your talent with us. Good luck. Two fabulous cards, lovely images. Very cute image and I love how the circle shape repeats. Thank you for sharing this in Artistic Inspirations, good luck. What a wonderful card! Thanks for joining us at Card and Scrap! Fabulous card. I really like how you captured the feel of bubbles. both cards are beautiful Vic. 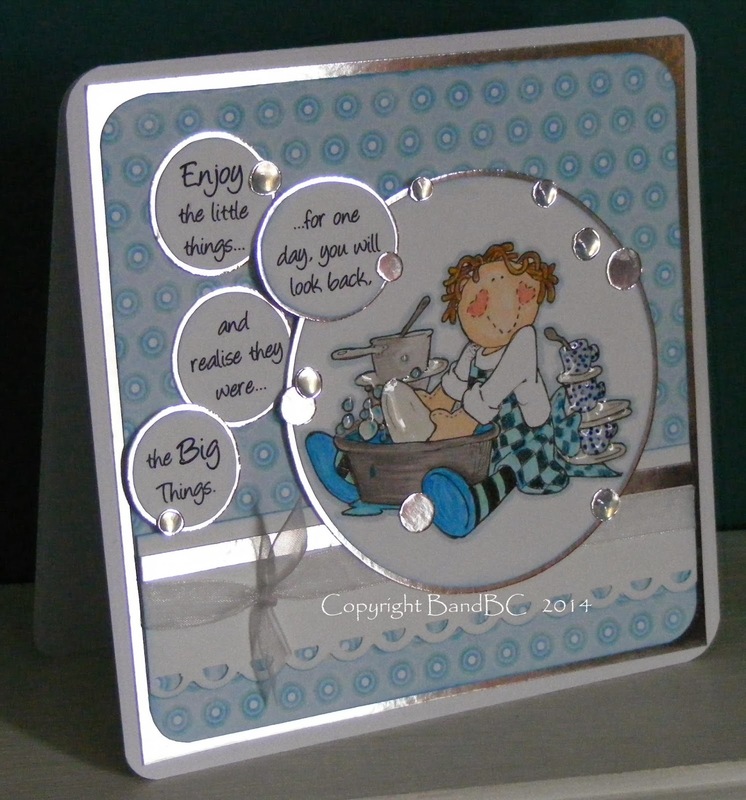 Love the beautiful silver foil papers you used! Beautiful card! Great for our color scheme/pic inspiration challenge. Thanks for playing along with us this fortnight at Lia Stampz! Amazing project! Thank you for joining us at Cards Galore Challenge - Anything Goes. I hope you’ll join us in our next challenge. These are such adorable cards...those images are just too sweet. I especially like the one with the woman doing dishes and that sentiment...not sure how much I really enjoy doing dishes though lol. Thanks for playing in our challenge Add a Real Ribbon at Digistamps4Joy! Good luck and we hope to see you again. Gorgeous cards. Love the images!! Thanks for playing along at Digitally Sweet. Lisa - Digitally Sweet DT. 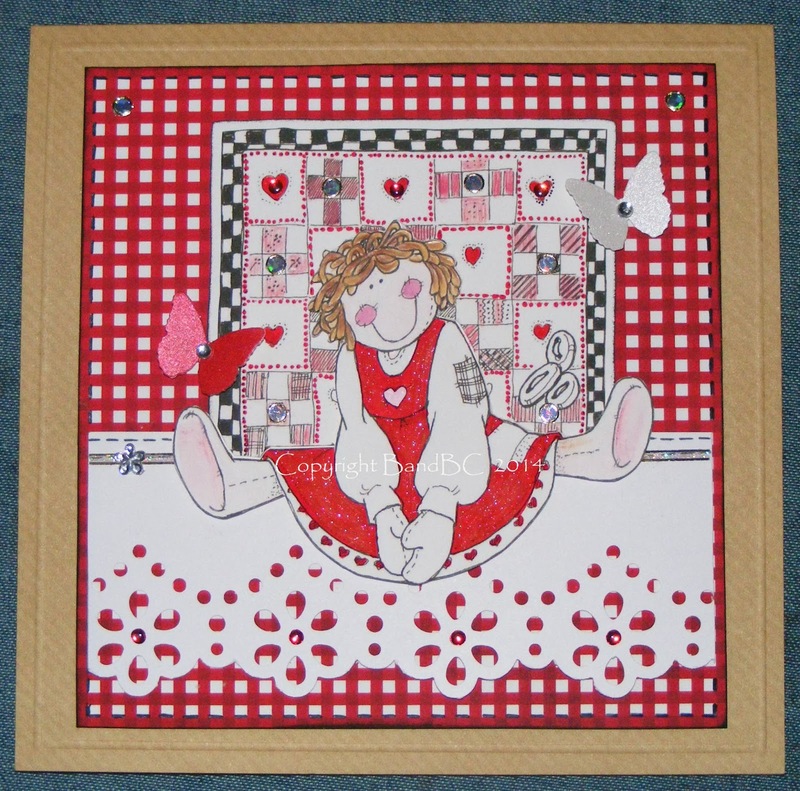 Cute cards with the rag doll! ohhh these are soooo cute! Totally love them both. And fab sentiment on the 2nd one, love how you have done it. Thank you for sharing your lovely card with us at Craft-Room challenge.